Back in the days before radio and other communications devices, flags were the primary means for communicating on the seas. As a result, strict protocol was adapted to ensure accurate communication and avoid misinterpretation of signalling intentions. Today, the tradition has much less significance because of modern electronics but those electronics can and do fail. Knowing how to follow acceptable protocol, and signals could save you in an emergency situation. The following text was scanned and edited from the 61th addition of "Chapman Piloting Seamanship & Small Boat Handling", Elbert S. Maloney, Hearst Marine Books, New York, 1995. Note, flags, ensigns, pennants, or burgee may not be drawn to exact scale. In many cases, it was necessary to compromise their scale in order to meet the restrictions of the media. The U.S. ensign is proper for all U.S. yachts, without reservation. This is "Old Glory," with 50 stars and 13 stripes. All boats, when at anchor, fly it from the stern staff, if so equipped, only while occupied. It is flown from the stern staff of powerboats underway on inland waters. If the powerboat has a mast and gaff, the proper display is at the gaff. On a sportsfisherman, where a stern staff would be in the way of the action, the practice is to fly the ensign from a halyard rigged just behind the tuna tower. On Marconi-rigged sailboats under sail alone, the practice for many years had been to fly the ensign from the leech of the aftermost sail, approximately 2/3 the length of the leech above the clew. This puts it in about the same position it would occupy if the boat were gaff-rigged, and on gaff-rigged sailboats it is proper to fly the ensign from the peak of the aftermost gaff. The advent of the modern high-aspect-ratio rig, with the boom end well inboard of the stern, has made it is possible to fly the ensign from the stern staff of a sailboat underway, and this is now an accepted practice. However, the ensign should never be displayed while the boat is racing. Under power alone, or at anchor or made fast, the ensign should be flown from the stern staff of all sailboats. If an overhanging boom requires that the staff be off center, it should preferably be on the starboard side. 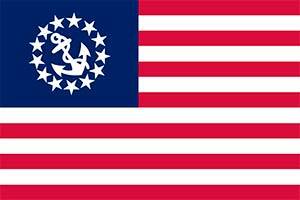 This is the 13-star "Betsy Ross" flag, with a fouled anchor in the union. Originally restricted to documented vessels of a specific classification, it is now flown on recreational boats of all types and sizes instead of the National Flag. Many yacht clubs now follow bylaws requiring that the Yacht ensign be flown reguardless of boat size or documentation status. Whenever a boat is taken into international or foreign waters, however, the 50-star U.S. ensign is the proper flag to display and the yacht ensign is not to be displayed. The USPS ensign is flown as a signal to others that the boat is commanded by an active member of USPS in good standing. USPS is a national fraternity of boaters dedicated to better and safer boating through education and civic service. The preferred location for flying the USPS ensign is the starboard yardarm or spreader, underway or at anchor, or made fast to shore, on motor and sailing craft. It may be flown from the stern staff in place of the U.S. or yacht ensign, but this is usually done only on smaller boats that lack a mast. On sailboats underway, it may be flown from the aftermost peak or leech in place of other ensigns. The USPS ensign may be flown at its proper location on boats displaying the United States Coast Guard Auxiliary ensign to indicate the owner is a member of both organizations; however, it cannot be flown if the craft is under Coast Guard orders. 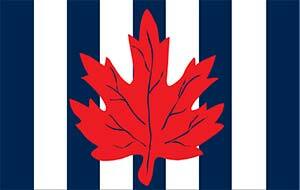 A flag frequently seen on the United States northern border is the Canadian Power & Sail Squadrons ensign. While there is no official connection between USPS and CPS, a strong "unofficial bond" does exist. The CPS ensign is CPS counterpart to the USPS ensign. 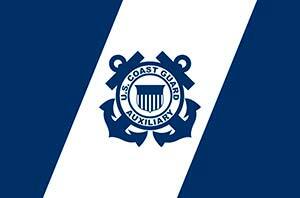 Known as the "blue ensign," the USCG Auxiliary flag is flown on a boat that has been approved as a "Facility" by the organization for the current year. It is flown both day and night. On a vessel without a mast, the blue ensign is flown at the bow staff; if there is one mast, it is flown at the masthead. On a vessel with two or more masts, the USCG Auxiliary ensign is displayed at the main masthead. It is never flown in place of the national ensign. When this ensign is displayed, it is improper to hoist a guest, owner absent, meal, cocktail, or novelty flag. The boat of a member of the USCG Auxiliary that meets a particularly high standard of equipment and availability is called an "Operational Facility," and can be called on for use under Coast Guard orders in assistance and patrol missions. When operating under USCG orders, these boats fly the Coast Guard Auxiliary operational ensign--white with the Coast Guard's "racing stripes" of red and blue-- in place of the "blue ensign." No other flags are to be flown except the U.S. ensign or appropriate USCG Auxiliary officer flag. Generally triangular in shape although sometimes swallow-tailed, the yacht club burgee may be flown by day only, or day and night, as determined by the individual yacht club. It is flown from the bow staff of mastless and single-masted motorboats, at the foremost masthead of vessels with two or more masts, and the main masthead of ketches and yawls. 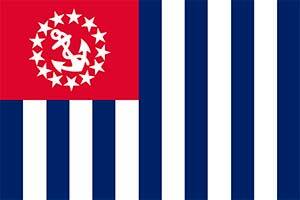 The burgee may be flown while underway (but not racing) and at anchor. You may substitute the owner's private signal for the burgee on single-masted yachts without bow staff, when the boat is underway. 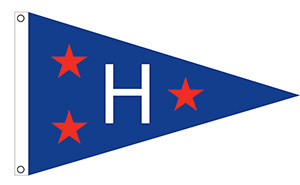 You can order your Yacht Club's Burgee from FlagandBanner.com. Get a free quote now for it. A distinguishing USPS Squadron burgee which has been authorized by USPS may be flown in lieu of a club burgeeand from the same positions. This burgee may be flown by day only, or both day and night. Get a free quote online now for custom club burgees. This is generally swallow-tailed in shape, but may be rectangular or pennant-shaped. It is flown from the masthead of a single-masted motorboat or sailboat, or from the aftermost mast of motor or sailing vessels with two or more masts. It may be flown by day only, or day and night. A mastless motorboat may fly this signal from the bow staff in place of a club burgee. Get a free quote online now for custom owner's private signal flags. Flags designating yacht club or USPS officers are rectangular in shape, blue (with white design) for senior officers; red for next lower in rank; and white (with blue design) for lower ranks. Other officer flags may be swallow-tailed or triangular in shape. An officer flag is flown in place of the owner's private signal on all rigs of motor and sailing vessels except single-masted sailboats, when it is flown in place of the club burgee at the masthead. On smaller motor boats without a signal mast, a USPS officer flag may be flown from a radio antenna, preferably to starboard, either singly or beneath the USPS ensign. The flag of a USCG Auxiliary officer flies day and night when the officer is on board. On a vessel without a mast, it is flown at the bow staff in place of the USCG Auxiliary ensign; on a vessel with a mast, it is flown at the starboard spreader. Past officer burgees are displayed in the same manner. Only one officers pennant may be flown at a time, and an incumbent officers pennant invariably takes precedence. When the Auxiliary ensign is displayed, it is considered improper to hoist a guest, owner absent, meal, cocktail, or novelty flag. 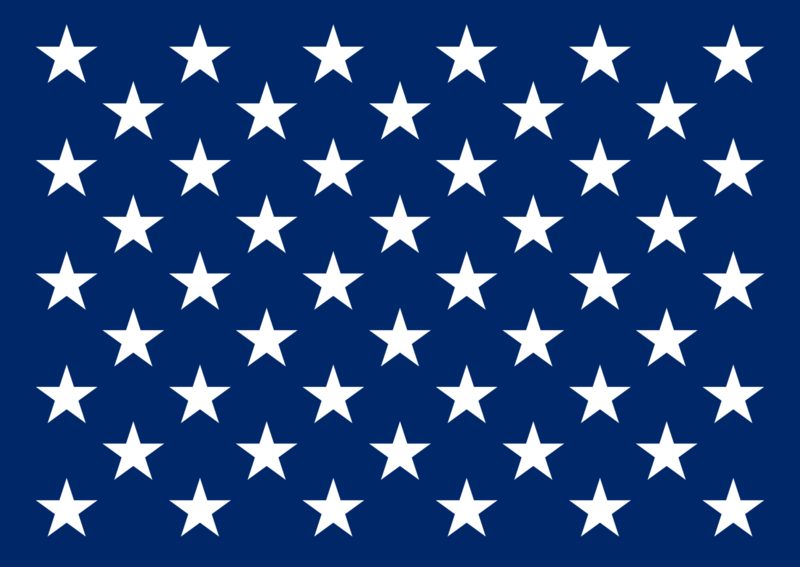 A rectangular blue flag with 50 stars-the upper quadrant of the National Ensign nearest the hoist, properly referred to as a canton. It may be flown only at the jack staff on sailing yachts or the jack staff of motor yachts with more than one mast, only while not underway on Sundays and national holidays. USPS does not encourage the use of the Union Jack in association with recreational boating. Although flags come in a fixed, standardized series of sizes, there are guidelines which will help in selecting the proper size for your boat. Keeping in mind that flags are more often too small than too large, use the rules given below, and round upward to the nearest larger standard size. The flag at the stern of your boat-U.S. ensign, yacht ensign, or USPS ensign-should be one inch on the fly for each foot of overall length. The hoist will normally be two-thirds of the fly, but some flags such as the USCG Auxiliary ensign have different proportions. Other flags such as club burgees, officer flags, and private signals for use on sailboats should be approximately 1/2 inch on the fly for each foot of the highest mast above the water. For flying on powerboats, these flags should be roughly 5/8 inch on the fly for each foot of overall length. The shape and proportions of pennants and burgees will be prescribed by the organization to which they relate. A union jack should be the same size as the corresponding portion of the national ensign. Here is a handy chart to help you find what size flag you need for your vessel. 20' 8 x 12" 12 x 18"
20' 10 x 15" 12 x 18"
25' 10 x 15" 16 x 24"
30' 12 x 18" 16 x 24"
35' 12 x 18" 24 x 36"
40' 14 x 21" 24 x 36"
45' 14 x 21" 24 x 36"
20' 10 x 15" 16 x 24"
30' 12 x 18" 24 x 36"
35' 14 x 21" 24 x 36"
A handy guide to flying the U.S. flag on a boat can be found on our flag etiquette page. If the boat bears a valid USCG Auxiliary Facility decal, it would be flying the Auxiliary ensign at the masthead day and night. 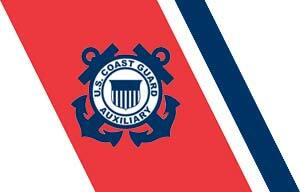 The USCG Auxiliary officers pennant or burgee may be flown day or night. On smaller craft, the same sequence should be followed, with the flags on their staff being set in the appropriate locations. At sunset, colors not properly flown on a day-and-night basis should be lowered in reverse sequence, the ensign at the stern always being the last to be secured. On national holidays, at regattas, and on other special occasions, yachts often "dress ship" with International Code signal flags. The ship is dressed at 0800, and remains so dressed until evening colors (while at anchor only, except for a vessel's maiden and final voyages, and participation in a marine parade or other unique situation). We sell a string pennant set of signal flags that are great for easily dressing ship for parades and regattas. In dressing ship, the yacht ensign is hoisted at the stern staff, and the Union Jack may be displayed at the jack (bow) staff. A rainbow of flags of the International Code is arranged, reaching from the water line forward to the water line aft, by way of the bowsprit end (or stem if there's no bowsprit) and the masthead(s). Flags and pennants are bent on alternately, rather than in any indiscriminate manner. Since there are twice as many letter flags as numeral pennants, it is good practice, as in the Navy, to follow a sequence of two flags, one pennant, two flags, one pennant, throughout. Starting from forward: AB2, UJ1, KE3, GH6, IV5, FL4, DM7, PO Third Repeater, RN First Repeater, ST Zero, CX9, WQ8, ZY Second Repeater. You can learn more from our blog about how to dress skip. Although these points serve as protocol in most waters, keep in mind that customs observed in various foreign waters differ from one another; in case of doubt, inquire locally or observe other craft from your country. 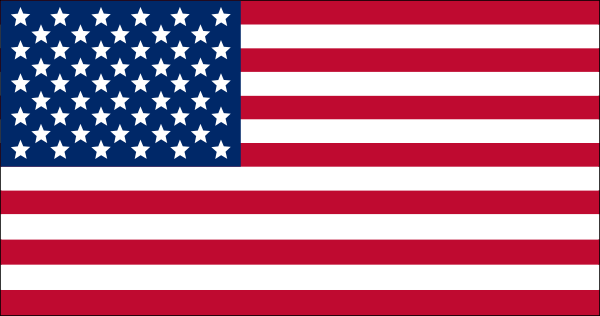 As noted previously, U.S. vessels while in international or foreign waters must fly the U.S. ensign (50-star flag) at the stern or gaff or leech, rather than the USPS ensign or the yacht ensign. When the starboard spreader is used for the "courtesy ensign" of the foreign country, the USPS ensign or similar flag may be flown from the port spreader; if the vessel has multiple flag halyards on the starboard spreader, the USPS ensign is flown there, inboard from the courtesy ensign. The U.S. ensign, club burgee, officer flag, and private signal are flown as in home waters. Don't fly a foreign courtesy ensign after you have returned to U.S. waters. Although this may show that you've "been there," it is not proper flag etiquette. A flag is flown at half-mast (or half-staff) in respect for a deceased person. Although there are no laws governing the half-masting of flags on private vessels, or at private homes and clubs, most citizens follow the flag display customs that are used on U.S. Government buildings and ships. The only authorities who can direct that the U.S. ensign be flown at half-mast are the President and the governor of a state, territory or possession. The duration varies from a day or so up to 30 days, determined by the deceased person's position. It is not correct for a yacht club commodore, or official of a similar organization, to order the U.S. ensign to be flown at half-mast to honor a deceased member -- only the burgee or organization flag may be half-masted. On Memorial Day, the U.S. flag is flown at half-mast until 1220, the time of the final gun of the traditional 21-gun salute commencing at noon. On a simple flagstaff-as at the stern of a vessel or a flagpole ashore-the "half-mast" position is approximately three/fourths the way up to the top. If the flagpole has a yardarm, or yardarm and gaff, the half-mast position is that which is level with the yardarm. When the U.S. flag is displayed at half-mast on a vessel, other flags remain at their normal position. When it is half-masted ashore, fly only a private signal or club burgee at masthead of a gaff-rigged mast with it. When the U.S. ensign is to be flown at half-mast, it should be hoisted fully and smartly, then lowered ceremoniously to the half-mast position. Before lowering, it is again raised to full height and lowered from there. Some yacht clubs follow the practice of flying the burgee at half-mast for a period of mourning on the death of a club member. A private signal may be flown at half-mast on the death of the owner of that vessel. You can learn even more about flag etiquette for boating at United States Power Squadrons. This group the world's largest recreational boating organization with more than 35,000 members and they teach boating courses for those just getting into power boating or sailing or anyone needing a brush up course after time away from the sport. The International Code of Signals is a system of internationally recognized alphabetical and numerical flags and pennants that can be used to communicate on the open water. The set is also known as International Code Signal and the nautical flag alphabet. 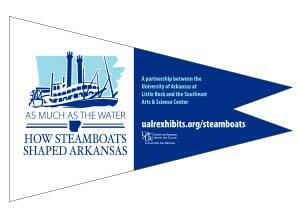 Boat enthusiasts also use the flags and pennants in fun ways to decorate their homes and boats. We sell 3 varieties of these flags plus a full set of string pennants that are perfect for dressing ship. Our flags come either with grommets, rope and snap hook or rope and toggle for the tradionalists. Full kits or indvidual flags are available.